Northern Tablelands MP Adam Marshall, left, Armidale Regional Councillor Di Gray, CEO Susan Law and Councillors Lib Martin and Peter Bailey at the Monkton Aquatic Centre in Armidale yesterday. 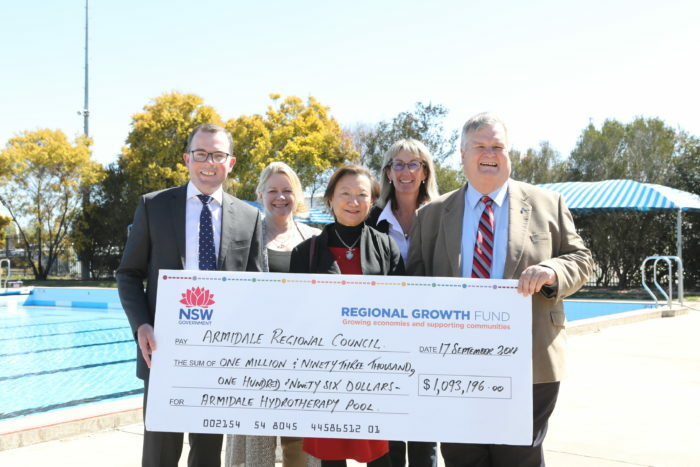 NORTHERN Tablelands MP Adam Marshall yesterday delivered a $1.1 million NSW Government funding splash that will see a new public hydrotherapy pool constructed in Armidale. Mr Marshall announced the government has committed $1,093,196 to Armidale Regional Council to build a new $1.5 million facility at the Monckton Aquatic Centre in Dumaresq Street. The news has been described as fantastic by Armidale Regional Councillor Peter Bailey, who was at the announcement this morning. Cr Bailey said the funding, through the NSW Stronger Country Communities Fund program, was a remarkable win that would enhance the reputation of Armidale as a leading sporting centre for the New England North West. “It will be a pool open seven days a week and accessible to the wider public and that’s a great outcome for us,” Cr Bailey said. Mr Marshall said a new hydrotherapy pool was integral to the Armidale region’s health infrastructure and would end the plague of problems experienced over the past few years with the 40-year-old pool operated by Hunter New England Health. Cr Bailey said a new hydro-pool in the centre of the city and run by the council would make it more accessible to more people and with no restrictions like those under the management of the current pool. Mr Marshall said securing a new location and a new pool had been on his priority list since the near closure and problems associated with the existing pool over the past two years. “There’s no hiding the need for a new hydro pool and the decision by Armidale Regional Council to apply for funding under this program and get that funding is a great solution for that plan,” Mr Marshall said. “The woes of Armidale’s hydro pool facility have been ongoing for years. The ageing facility was resuscitated from a premature death in 2017 thanks to the efforts of volunteers, community members, the local council and with a fair bit of push-and-shove from me on behalf of all the stakeholders. Cr Bailey said the hydro-pool project had topped the list when Armidale Regional Council consulted with the community about the best projects to put up under the State Government program. Mr Marshall said the pool project will provide post-operative, therapeutic, and preventative health benefits to a potential catchment of more than 50,000 residents and visitors each year. “The project will contribute flow-on economic benefits to tax payers via reduced costs of treatment for muscular-skeletal and other medical conditions; positive psycho-social and mental health outcomes; and improved work productivity,” Mr Marshall said. Cr Bailey said the project plan was for a 162 square metre indoor heated facility built at Monckton Aquatic Centre and design investigations were underway to determine the exact location of the pool at the centre location. “Once we agree on the site within the complex then we will get to work and I would expect a 12-month construction period and then it will be open for business,” Cr Bailey said. Mr Marshall said the plan was to build a stand-alone facility that would be run by council and co-locating the hydrotherapy pool near other pool facilities made operational sense. “It means that other community groups will have greater access to the facility, supporting the cost of running the pool,” Mr Marshall said. “This includes groups such as junior swim clubs, aqua-aerobics for older residents and those rehabilitating from sport injuries and special needs groups. “A more user-friendly hydro pool is key to its ongoing success. “I commend Armidale Regional Council for being proactive and not waiting for the current facility to finally hit a terminal issue – be it a filter, or a lack of backing from the Local Health District.